Howdy! Today, the prompt is gradient nails, so I made one out of some colors I thought would look great together (and they do), but they gave me more of a summertime feel once I applied them. Yes, it's after Labor Day, and everyone is back to school, but the temperatures around here still say Summer to me! So with today's manicure, I'm squeezing out that last little bit of summer out before those leaves start changing, and it's time to break out the sweaters and blankies on movie night. China Glaze - White On White for my base. OPI - Primarily Yellow for middle color. OPI - Landscape Artist for nail tip color. OPI - Pen & Pink for top of the nail bed. Essie - Shine of the Times over gradient to pull from some of the colors in the gradient and make it really shine. 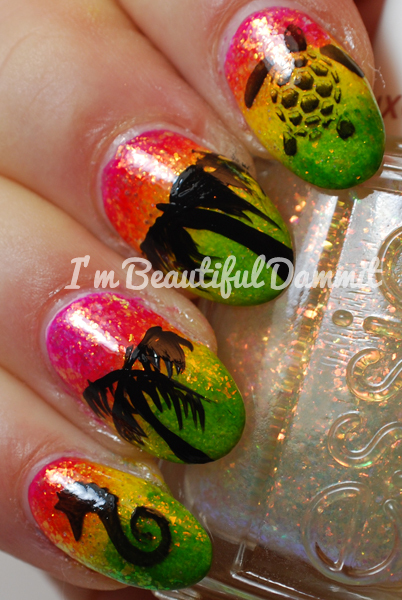 Liquitex - Basics acrylic paint for the palm trees. Salon Express - Stamping plate SE19 for seahorse. Salon Express - Stamping plate SE21 for sea turtle.